Can someone help me out? I'm thinking about buying a Book 2 13.5 inch and I keep seeing slight differences. Does this device come with a 6th Gen or 7th Gen Processor for the i5 model? On certain sights I keep seeing both which makes me think someone is selling a Surface Book as a Surface Book 2. Your choice is either a 7th gen i5 or 8th gen i7 Intel. Nevermind. 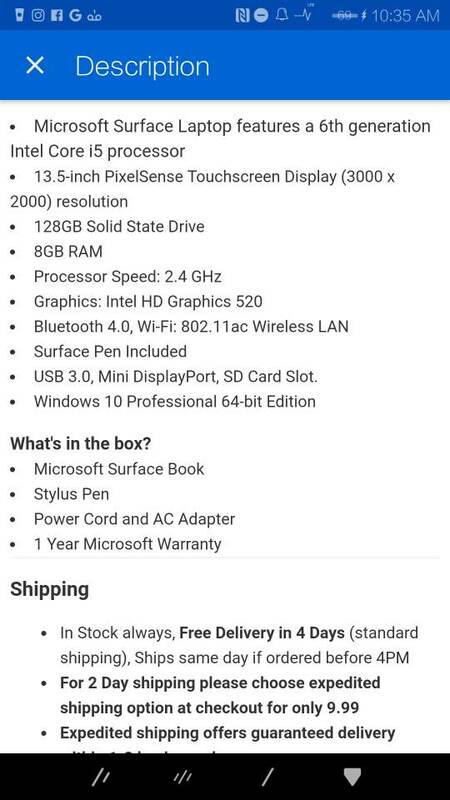 I think this person is selling a Surface Book and not a Book 2, but listing it as the latter. This is why I never buy a high end device on eBay. Smh. Depending on the money, you may want to opt for the 8th gen it is a LOT better, it's a 6 core CPU. If you want to game or do any heavy processing tasks such as video or photo editing, the 8th gen would be much better. Not to say the 7th gen is bad, just that Intel made a major jump with the 8th gen chips. The same thing happened with Nvidia graphics cards between the 9XX series and 10XX. ALWAYS opt for 10XX. I'm inclined to agree. eBay might be interested in knowing about this listing. OK. I misread this listing. Lol . The person is not lying, it IS a Book 1. It just came up while I was searching for a Book 2. Doesn't matter, I went to the MS Store today and bought one with my teacher discount. Best deal I could find. Cool. Let us know what you think of it when you get it. Np. I'm hoping for good things as I've been a SP (3 then 4) owner for years. I like the brand and can't see myself using anything else. It was time to upgrade so Book 2 it was. FAHMI BASSEM, RaRa85 and pkcable like this.